At the age of seven, Kabilesh, son of Kalidoss – Kanimozhi, began suffering from breathlessness and after the family and upon consulting with the doctors he was brought to Chennai at Apollo children Hospital where he was diagnosed with Congenital Heart disease. The only treatment for Kabilesh was an Open heart surgery which would approximately cost Rs 10,10, 000/-. The family has been staying in Chennai from few months and has spent the entire money for the child’s investigations & stay. Unfortunately, Kalidoss, with a salary of just 4000 Rs cannot afford the cost of the treatment. He needs our help to save his son. Kabilesh son of Kalidoss – Kanimozhi residing at 2/33A, Nithiya Pettai, Thirupayithangudi (P.O), Nagapattinam has born with rarest of heart defects, he has to undergo an open heart surgery. Kalidoss is doing all he can to continue the life- saving treatment he needs every minute but he has exhausted all he had. Basically, due to an abnormality in the heart’s arteries, his heart muscle didn’t get enough oxygen. The tissue begins to die due to lack of oxygen and this cause a heart attack in the child. Inside the heart three holes also there. Kabilesh ejection fraction which is the amount of blood pumped out with each heartbeat was 21% instead of 70-75%. A blood which is not properly pumped it is been flowing all over the body leading to pale blue colour change in the child body. Being just over a 7 years old he was at sever risk of heart failure and death, with little chances of survival and urgently needed a very risky open- heart surgery to correct this. Already they are poor and do not have proper resources to save the child. The doctor has managed to pay up to 7 Lakhs up till now. Dr. Anuradha Sridhar from Apollo child care estimated cost for Kabilesh complete treatment is around Rs. 7 Lakhs, but could even go up Rs 10 Lakhs for medical treatment, given the unpredictable nature of Kabilesh Extremely critical state. Unfortunately, Kalidoss, with a salary of just 4000 Rs cannot afford the cost of the treatment. He needs our help to save his son. 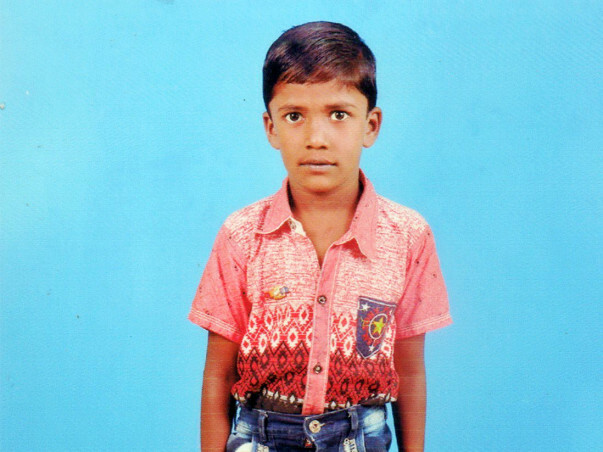 Now, Kalidoss – Kanimozhi need your help to continue providing the treatment Kabilesh desperately needs every minute. Your contribution can give Kabilesh the treatment he deserves can save 7-Year-old Kabilesh life. We hope you will support us. We hope a positive reply from your side. Your small help will save the little child life.